I wonder why they didn't even spread the mashed potato around? Before I dive on in to this next review, I'd like to share some really interesting news! Just earlier today, my little blog was featured in the Wall Street Journal! Long time readers, please go give it a read if you'd like to know a little more about me, or the history of the blog. New readers that have only just discovered the site because of the article, I hope you enjoy the blog as much as I do writing it. Feel free to reach out to me via email (right or bottom of the page) for anything at all, or you can always find me on Twitter. Now, on to what everyone is here for - McDonald's Around the World! Minimal branding. I wonder when the "name" is decided if they will re-release? Last week when The Wife and I tried out the McChocolate Potato, we had actually ordered it as a side for this burger. What makes this burger a bit difficult to review is that at the time of writing is still completely unnamed. 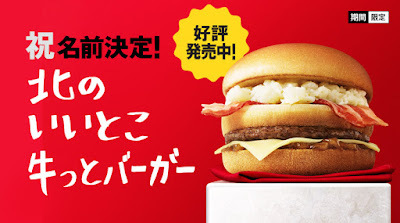 The idea was that you could try the burger, and then go online to the official McDonald's Japan website and enter what you feel it could be called. The official rules were in Japanese, so I couldn't really get all the details about what you could win if your name was selected, but submissions closed last week, and the official name is going to be unveiled next week. Whether or not this will become a regular menu item, or will still only stick around with the winning name for a couple more weeks is also unknown. When I last checked the website, the current leading name translated to "The Hokkaido Burger", and since many of it's "special" ingredients were sourced from the Japanese island of Hokkaido, which is coincidentally where I reviewed this burger, for the purposes of this review, I'm going to call it that for now. The bacon down there might look nice, but it's McDonald's Japan standard. When I cracked open the nearly blank box (I guess if it doesn't have a name, you can't slap branding all over the box), I was pretty shocked by how small the burger was. I know Japan is known for having small portion sizes, but I've had some big ones in the aptly named "Big America" series, and since it was using a centre bun like a Big Mac, I expected it to be bigger. It was stacked relatively tall, but it couldn't have been wider than a standard dollar menu Cheese Burger. The biggest draw for this promo would have to be the mashed potatoes. Hokkaido mashed potatoes are usually fragrant, and fluffy. The single scoop of potato they had on my burger was cold, gritty and tasteless. Hot and steamy mashed potatoes, especially if they were from Hokkaido, would have been great, but these it actually made the burger worse, which long time readers will know I don't say all that often. The only redeeming quality they had is that you could tell they were real mashed potatoes, they weren't from a box, but problem was they tasted like they were mashed 3 days ago and left to sit...I've had Limited Time items with strange toppings before, but Mashed Potato was a first for me. McDonald's Philippines served Mashed Potatoes as a side, and I was able to give those a try, but those certainly weren't any better. The other Hokkaido-sourced ingredients couldn't help save this burger either! 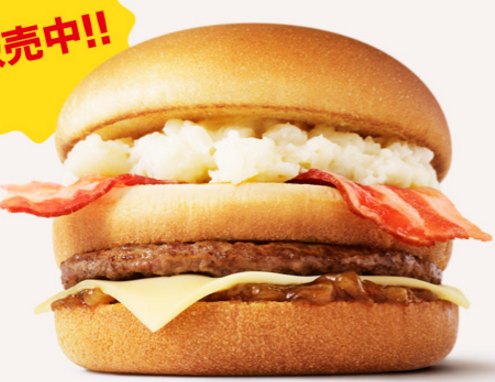 When I saw the promotional photos for this burger, I had thought the onions, which are another Hokkaido speciality, were grilled onions which I've had on a few burgers now. Unfortunately they were uncooked onions, drown out in this horribly sweet sauce, which distracted from any crunch they still had. But, I have a feeling with how gritty the mashed potato was, fresh onions might have only added to that dryness. The "Hokkaido cheese" should have saved this burger, as the as Hokkaido might be famous for both other ingredients, they have to be the most famous for dairy! I went in expecting a real slice of cheese, something that is becoming increasingly common at McDonald's, but McDonald's Japan took the discount route and made this a processed cheese slice after all. Looking through their website, it's in fact only a 60% Hokkaido:40% Australia processed cheese blend. The only difference I could taste between this, and the standard McDonald's processed cheese slice was it was a bit saltier than usual, which leads me to the meat. Once you squish it down, it starts to show its true size! One other point I will quickly mention, is even though this burger is small, it still packed on the carbs with 3 slices of bread, potato, bacon and cheese. One real oversight was the small $1 hamburger patty they used on the bottom of it all. That single thin patty could not be tasted whatsoever, and I think this was known, because they attempted to bring out it's flavour by over-seasoning it beyond belief. Both the wife and I commented on how salty the burger was, even when most of the other toppings weren't all that salty to begin with. You can see the pepper, but added salt was the real problem here. All said and done, this was easily the worst promo burger I've ever had in Japan. All 3 promoted "special" ingredients were either disappointing or downright bad, and honestly, give Hokkaido a bad name. The rest of the burger made of standard ingredients couldn't support the premium price tag they charged. A photo of me after my first bite...I think my face says it all. I'm never going to be as happy as this guy. 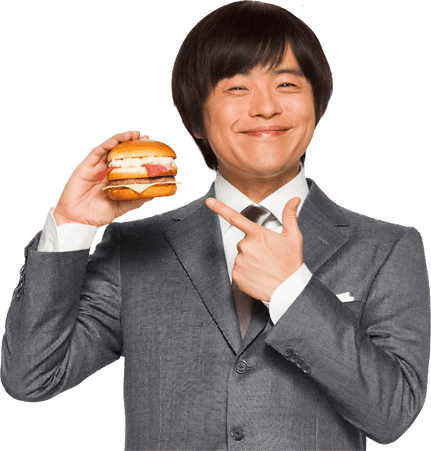 He's the "character" used to promote the burger all over Japan. 22 FEB 2016 Edit - Since writing this review, McDonald's Japan has unveiled the official name as - "北のいいとこ牛っとバーガー" So I guess The Hokkaido Burger was a bit too generic for their contest. Proud of you, dude! I've seen your blog grow from the beginning!!! Just found your blog as well - excellent stuff! Congrats on being featured in the WSJ! I love reading your reviews! Reading your reviews from Ottawa Canada in our local newspaper! thanks alot. Great read.. Love McDonald's so it's nice to see what else is out there..